There have been some changes in the editorial staff of the DOINGS. Brian Beattie left DDO for New York and the allure of the dot-coms this past April, but his influence on the DOINGS is still apparent in the layout and design. Thanks to Brian for all the work he put into the DOINGS over the years! He has been replaced as Co-editor by Mike Allen, who has added some nice touches of his own. Tracy Clarke, who did a great job of galvanizing the students to contribute, has completed her Ph.D. degree and has moved on to bigger and better things at the VLA. Chris Tycner is the new Associate Editor for the students and brings to the position some very impressive persuasive powers. He is responsible for getting all the new students to pose for pictures and to write about themselves - a daunting task. And as for me, I'm still around, providing some continuity and perspective. All the gains and losses have cost us time, so we've missed a few deadlines, but we're learning as we go. We hope that you enjoy reading this and future issues. so much that you will want to be a participant. Send us news and views; we welcome all contributions: large or small, formal or informal, funny or sad, scientific or personal. Prof. Simon Lilly has been appointed the Director of the Hertzberg Institute for Astrophysics, and will begin his duties there this autumn. The faculty, students and staff wish him all the best for this exciting, new challenge! The DA welcomes two new postdoctoral fellows this year: Philippe Fischer and Siow-Wang Lee. The DA welcomes 8 new graduate students this year. Stepping directly into the PhD program is Lihong Yao. At the MSc level we welcome Paula Ehlers, Megan McClure, Vjara Miovic, Lawrence Mudryk, Jenna O'Neill, Tim Rothwell and David Whipps. 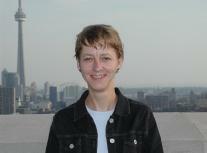 Pat Hall has moved to a new postdoctoral position at P.U. Catolica in Chile. His recent work has been on gravitational lenses from the CNOC surveys. That work is highlighted at http://www.starstuff.org/Articles/823.asp. We wish you the best of luck at your new position, Pat! 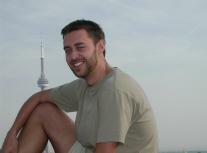 Marshall McCall (York University) has recently finished his sabbatical at the David Dunlap Observaotry. 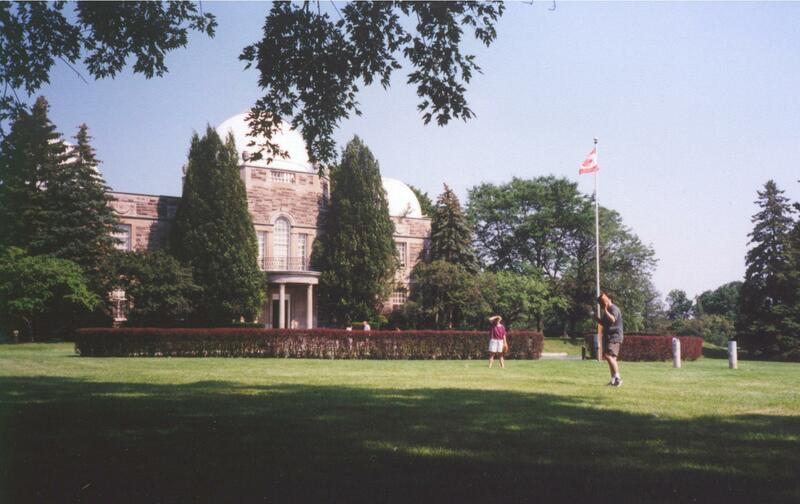 Michael DeRobertis (York University) will be starting a sabbatical at the David Dunlap Observatory starting January 2001. In June of this year Marlene Cummins attended, as usual, the annual conference of the Special Libraries Association, this year in Philadelphia. There she was pleased and surprised to receive special recognition from the Physics-Astronomy-Math Division. A beautiful plaque was given to her which read "with deep appreciation for her dedicated service and outstanding contributions as Editor of the PAM Manual and keeper of PAM's corporate memory 1990-2000"
Tom and Susan Bolton helped lead a three day astronomy canoe trip on the French River in July. The trip was attended by 16 people between ages 17 and 50. The weather was mediocre due to a persistent cold low, but there was sufficient clear weather to allow several hours of star gazing each night. The site on the river had an excellent horizon with no light pollution. Unfortunately, Tom and Susan had to cut their trip short because of some misadventures to be described in a later issue of the Doings. 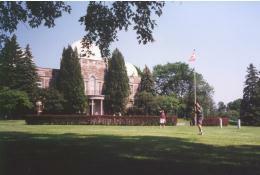 International Planetarium Society, Montreal; he served on a panel on "misconceptions in astronomy", presenting the results of the OISE/UT's project on teachers' misconceptions in astronomy. Another panellist was Jon Miller, the "guru" of science literacy studies in North America, who presented an interesting study of where people acquire their astronomical knowledge. Astronomical Society of the Pacific, Pasadena; the OISE/UT astronomy group gave two presentations to the annual teachers' workshop; one on "Multicultural Astronomy", and one on "Frames of Reference" using the example of how the sky would look during the "summer" olympics in Sydney. In addition, John, Wayne Barkhouse, and Mindy Kalchman (OISE/UT) gave presentations at the Symposium on Teaching Introductory Astronomy to Non-Science Students. International Astronomical Union General Assembly, Manchester UK; John participated in a special symposium on Astronomy for Developing Countries, and also in a one-day meeting for astronomers and schoolteachers. "P Cygni 2000", in Armagh, Northern Ireland; this workshop celebrated the 400th anniversary of the first (recorded) outburst of this luminous blue variable, and the retirement of Mart de Groot, who has done much of the recent research on this star. Bob Garrison has had a busy travel schedule. May 2000: CASCA meeting in Vancouver: poster paper "Reviving the Classics: the Bright Shell Stars in 1999." June 2000: JENAM 2000 meeting at Pulkova Observatory in St. Petersburg, Russia: "Spectrophotometric and Photometric Catalogs, Standard Stars and Solar Analogs" (Principal Invited Speaker - and the only non-Russian). 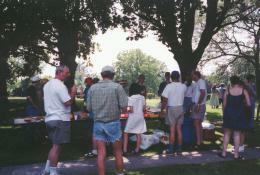 July 2000: RASC meeting in Winnipeg. Installed as President of the RASC, 2000-2002; poster paper: "Pleione: a New Shell Phase." October 2000: Roundtable discussion with Secretary of State for Science, Research and Development, Gilbert Normand, MP, on the question of whether Canada needs an Academy of Science for assessing government scientific proposals; Ottawa. Hi! my name is Paula Ehlers and I'm working with Prof. Barth Netterfield. 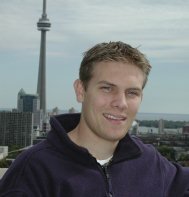 I'm from U. of T. and took mainly astronomy, physics and math courses in my undergrad program. My research interests include the Cosmic Microwave Background, General Relativity, Cosmology and Star Formation. I completed my B.Sc. in Astrophysics at the University of Calgary. My research experience at Calgary involved modeling light curves for extra-solar planet transits in the globular cluster 47 Tuc. My research interests are actually in the field of cosmology. I am interested in inhomogeneous models of the universe and the evolution of the universe's structure. In my spare time, I listen to Nirvana (or similar alternative music), write dark and disturbing poetry, study Buddhist philosophy, and play ice hockey (goal). I was born in Edmonton, Alberta and spent the first 18 years of my life on a farm near a town called Thorhild. I received my undergraduate degree in Physics from the University of Alberta over the course of five years. The extra year was spent in an internship program discovering the 'If it works, who cares why?' slant to industrial research. Here at Toronto, I am in the collaborative program working with Doug Johnstone on the ISM. My background in astronomy is comparable to that of the average housefly - truly exceptional houseflies may have more knowledge in certain areas. I am an avid swimmer, having worked as a lifeguard for a number of summers. I also enjoy reading and have the tendency to be in the middle of several books at once. Finally, I like to think that in a good percentage of alternate universes I've dedicated my life to becoming a concert pianist rather than a physicist. I can't seem to squeeze the required practice into this one. Finally in May of this year, Jenna's misguided attempts to get to space through engineering (Mechanical BASc, UWaterloo, Aerospace MASc, UofT) were overturned for the much more interesting pursuit of understanding its geometry, geography, and the inner workings of its component parts! (Astronomy MSc, started Sept. '00) Along with her avid and varied space interests (Canadian Space Society, Mars Society, hard sf & internet news junkie), she balances everything with a passion for gymnastics, which, unfortunately, has not been remotely reached by her skill... but she keeps trying! And just to prove that she's not as grounded in reality as all that - her main goal in life is to get off this rock!!! Hi, my name is Tim Rothwell. I'm originally from Prince George B.C. and I've returned there to complete my B.Sc. in Chemistry at the University of Northern British Columbia. I've also spent the past 16 months as a full time research assistant at UNBC in the Chemistry and Physics departments. My main research interests include quasi-classical trajectory studies of H_2 + H_2 in restricted geometries and theoretical low energy electron point-source (LEEPS) microscopy. I'm planning on continuing my work in molecular hydrogen here and I'm also interested in N-body simulations of galactic encounters and mergers. My interests outside of Astro/Chem/Physics include beadwork, celtic knotwork, and basic origami. When my eyes aren't glued to a computer screen, beadloom, or mangled sheet of paper, I curl up with a book by Tom Clancy, James Alan Gardener, or Robert Heinlein. Originally from Pointe-Claire Quebec (a suburb of Montreal), I did my undergraduate degree in Physics/Astrophysics at Queen's University in Kingston. I enjoy playing hockey and soccer on a competitive level as well freeweight training and volleyball on a somewhat less than competitive level. I'm a big music lover and my CD collection grows on a weekly basis. My scientific interests are diverse and as of yet I have not chosen a specific research topic for my M.Sc. "It would be as strange if a single ear of corn grew in a field as if there were only one world in the infinite." Aiming to achieve an understanding of the nature of gas and dust in galaxies of what we all came to be made of. 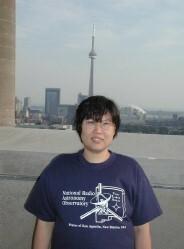 Please see Radio Astronomy Group webpage 'www.astro.utoronto.ca/~allen/radio' for more details. When I'm not studying or working, I hike, travel, ... Last year, I spent eight unforgettable days travelling across the precious and the strange land of Egypt. My name is Conrad Rogers (nickname *cosmo*, and it has nothing to do with my field...). I'm coming from a four year B.Sc. program at MCMaster in Physics, though I took as much Astronomy and Philosophy as I could get away with. You'll catch me skulking around the Dept., as Physics has put the collaborative astrophysics M.Sc. type people on the 11th floor. I hope to be working with Norm Murray downstairs, dropping rocks on stars. I completed my PhD at McMaster University in 1993 on "Dynamics of LMC Clusters". I started a postdoc at what was then AT&T Bell Laboratories in New Jersey in January 1993. Since then I have been spending most of my research time using gravitational lensing to measure the distribution of mass in the universe on scales ranging from galaxies to large scale structure. In 1995 I started a Hubble Fellowship at the University of Michigan and in January of 1999 I became a collaborator on the Sloan Digital Sky Survey. I have access to SDSS data for gravitational lensing based studies. 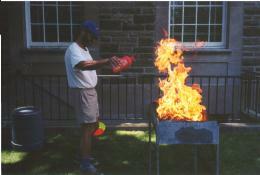 In July 2000 I moved to Toronto and started a postdoctoral fellowship with Ray Carlberg. We are collaborating on several lensing based projects to study CNOC1 and CNOC2 fields. On a more personal note I am married to Angela Punnett who is a pediatric haemotologist/oncologist at the Hospital for Sick Children. As a result I have a lot of time on my own which I fill with reading, working around the house, and researching investment ideas. I also go to a lot of movies as I do not own a television. I was originally from Singapore and that's where I completed my BSc in Mathematics. I received my MSc in Astronomy from St. Mary's University, working with Prof. George Mitchell, then went to the limestone city (Kingston) to do my PhD with Dr. Judith Irwin. Following my graduation, I spent two years as a postdoctoral fellow at the Institute of Astronomy and Astrophysics in Taipei, Taiwan. Since January 2000, I have been working with Prof. Ernie Seaquist as his postdoctoral fellow. My interest in Astronomy is in the interstellar medium of spiral galaxies, including normal galaxies, starburst galaxies, Seyfert galaxies and ultraluminous infrared galaxies. In the past, I have also worked on problems related to young stellar objects in the Milky Way Galaxy. I work mainly in the centimeter, millimetre and submillimetre wavelengths. Besides astronomy, my other interests include music (mainly Classical and Jazz), travelling (very convenient being an astronomer! ), reading (science fictions, fantasies, etc. ), fencing, stained glass making (I'm starting to take lessons soon). Dr. Wendy Freedman is the second Helen Sawyer Hogg Distinguished Visitor. Dr. Freedman will visit the department from Monday, February 26 to Thursday, March 1, 2001. A public lecture will take place on Tuesday, February 27, 2001 at 7:00 p.m. in the auditorium, Medical Sciences Building. On 1 July 2000, Bob Garrison became President of the Royal Astronomical Society of Canada (RASC) for a two-year term. The RASC is growing rapidly; membership has reached 4500. A centre has just been established in Charlottetown, PEI, so there are centres in all ten provinces. Please let me take this opportunity to introduce my daughter (the two of us are sharing a "quiet" moment right now while mom sleeps). Morgaine Saskia van Beers - "Saskia" was born on September 26th at 10:53pm in St. Michael's hospital (but almost in the mid-wife's mini-van!). Mother and father collectively lifted her into this world. She weighed in at 3005 gms (6 lbs 10 ounces) and 41 cm in length and is in fine health (including a good set of lungs). Mom and daughter are both doing well and father is "coping" with all the changes. Thanks to everyone for their support and understanding through this initial transition time. In May the students reluctantly permitted Wayne Barkhouse not to run again for president of GASA. The new executive is now Tracy Webb as Treasurer, Allen Attard as Secretary and myself as President. Our election season switches to November this year, so look for a shuffle of GASA positions then. The summer has been busy for us with the renovations of the offices and our preparations to make room for all eight new students! 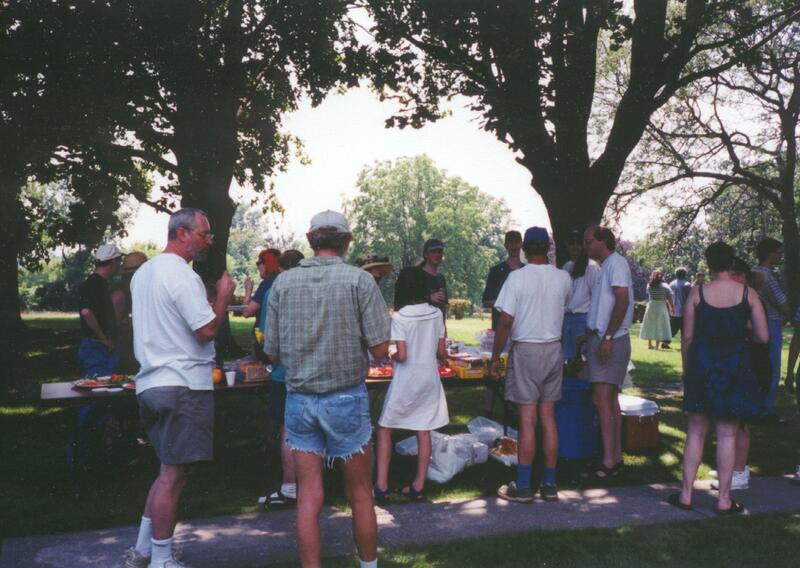 We did take time out for the annual DDO Picnic on July 26th, which was well attended and featured great weather, lots of food and drink, softball, frisbee, and leaping flames provided by Stefan. There is now an Earth and Planetary Science course at the Grade 12 level in the new school science curriculum in Ontario. It's not clear how many schools will offer it, and who will teach it; the Earth Science portion (not written by John Percy) is at a rather high level; the Planetary Science portion (written by John Percy) is sufficiently general for teachers to be able to pitch it to the grade 12 level. For a look at the course, see the Ministry of Education web site: www.edu.gov.on/eng/document/curricul/secondary/grade1112/science/science.html and go to the Earth Science course. It has been my experience that even such exalted citizens as professors of physical science rarely encounter the highest leaders of our land. Oh, we may meet the occasional mayor, MPP, or MP, but cabinet ministers and Prime Ministers are way out of our league. Usually. There was, of course the famous visit of William Lyon Mackenzie King to the Grand Opening of DDO which has been described in detail in earlier numbers of this journal. To the best of my knowledge, contacts between astronomers and Prime Ministers have been limited to nonexistent since that time. Well, I can't improve on that, but my wife Susan and I had an unforgettable encounter with former Prime Minister Pierre Trudeau in May, 1994, and now seems like a good time to tell the story. We were in Montreal to attend a meeting of the Royal Society of Canada. The meeting was to be followed by a special invitation only symposium on the Constitution, at which Trudeau was to be one of the main speakers. At the closing night awards banquet, there was an unusual buzz going around the room that Trudeau was at the banquet. Did you ever see a bunch of stuffed shirt academics try to scan a room with several hundred people in it without being obvious about it? It looks as silly as it sounds. In any event, our corner of the hall never figured out where he was sitting. When the banquet broke up, the guests were channeled down a long hallway toward the front hotel lobby. One of the more socially aggressive couples had stationed themselves near the end of this hallway and had gathered about a dozen people, from the flow of departing guests, who were interested in going out for some good music and drink. We were just beginning to get the group organized, when M. Trudeau came walking down the hall looking rather lost and lonely. I confess that I froze completely. It took me a couple of minutes to recover wits after I saw how small he is. Either TV gives no sense of size or I miss whatever clues there are about size on TV. In any event, I was dumbfounded when I realized he was smaller than I was in first grade. Once I got by that, I couldn't think of anything to say that he wouldn't have heard before. My brilliant Royal Society colleagues must have been having similar problems because they were equally silent. M. Trudeau on the other hand clearly wanted company. He could have walked by our little group, but he didn't. He hesitated as though he clearly wanted to be invited to join. So while all of the physical and earth scientists and engineers and their wives hesitated, Susan walked up to him boldly and proceeded to thank him for everything he had done for Canada. Well, that certainly cheered him up. I then got to see a demonstration of the Trudeau charm up close and personal, and it was awesome, even after she pointed out that her husband was standing right next to her. Susan's boldness loosened up a couple of others in the group, so there was a bit more discussion until we were organized to go. For some reason, no one thought to ask M. Trudeau whether he would like to join us, and he was too shy or proud to ask if he could come along. Perhaps it wasn't possible. I don't know. All I know is that when we left, I looked back and saw a look on his face that will define loneliness in my memory for the rest of my life. In May-June, I had the pleasure of being Erskine Visiting Fellow at the University of Canterbury, Christchurch. This is a very pleasant campus of about 10,000 students, located in "the most English city outside England" (a reasonable description). It turned out that I had to teach at least part of a course, because the purpose of the Erskine Bequest was "to improve the teaching of science and engineering at the University of Canterbury". Doesn't say much for Erskine's experience as an undergraduate! I ended up teaching part of an Astronomical Techniques course to third-year students. A pleasant bunch, but even less interactive than our students! University of Canterbury had begun as a small campus in the centre of the city. 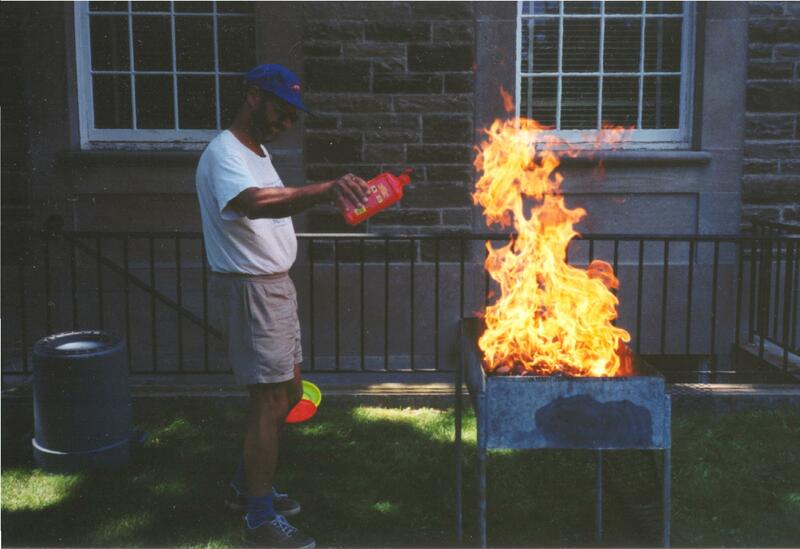 About 30 years ago, the university needed to expand. A new campus was built amidst pleasant parkland, about two km from the city centre. The city wisely preserved the architecturally striking buildings of the old campus; they are now a thriving Arts Centre, with theatre, concert hall, and crafts studios. They also include the old observatory with a 6" refractor, which is used for public nights by the university department of physics and astronomy. About the same time, the small astronomy group began to develop an observatory at a spectacular site at Mount John, overlooking Lake Tekapo. The observatory has a 1m telescope, very well instrumented for spectroscopy, and smaller telescopes instrumented for imaging and photometry. The greatest asset of the observatory is the two resident observers Alan Gilmore and Pam Kilmartin, who (along with the faculty and graduate students) are able to pursue long-term observational programs in stellar astronomy. The week I arrived in Christchurch, the president of the university took the visionary step to pledge up to $2,000,000 to join the Southern African Large Telescope project - the largest telescope project in the southern hemisphere, and a clone of the Hobby-Eberly telescope in Texas. Quite remarkable for a university with about four permanent astronomers! The astronomy group is now being expanded into theoretical and observational cosmology, in anticipation of the benefits which SALT will provide. All of this is a tribute to astronomer Peter Cottrell, the head of the physics and astronomy department, and my host during my visit. Another notable feature of New Zealand is that astronomy is compulsory at every level of the school science curriculum. As in Ontario, the teachers do not receive much support; curriculum support materials had been promised, but were long overdue, and teachers had little time for professional development. But I was able to do one-day workshops in three places across the country, and got appreciative audiences of 30-50 teachers for each one. Somewhere down my priority list is to prepare an article for the New Zealand Science Teachers' Journal, summarizing my impressions, and offering my advice. There are two public observatories (each with a planetarium) in the country: the Carter Observatory in Wellington, the capital, and the Auckland Observatory, in Auckland, the largest city. Both these facilities cater to the public and to schools; of the two, Auckland was the most dynamic and entrepreneurial. The New Zealanders, like us, are gradually being weaned off government funding, and into the private fundraising mode. Some are succeeding better than others. The other notable feature of New Zealand is the vitality of the amateur astronomy community. My impression is that New Zealanders are more inclined to participate in things, rather than just to watch. So community arts, and sports, were similarly thriving. Amateur astronomy has a long history in New Zealand. Frank Bateson, an amateur, was largely responsible for encouraging astronomy in the country, and building up the Royal Astronomical Society of New Zealand - still the only national astronomical society. Albert Jones is by far the most prolific visual observer of variable stars anywhere, with over 500,000 measurements (over twice as many as the second-place observer). A younger generation of amateur astronomers is active in projects such as Joe Patterson's "Center for Backyard Astrophysics" - a multi-longitude network of small telescopes used for photometry of cataclysmic variables. They are also becoming more active in public education, and n supporting astronomy in the schools. Astronomy has a long and rich heritage in New Zealand, starting with the astronavigation skills of the Maori who arrived about 1000 AD, and continuing with the arrival of astronomer-explorer James Cook who arrived about 1770. New Zealand is now in the forefront of astronomical research and education - not bad for a country with about the same population as the GTA! This past summer in the month of August, I had the privilege to attend the Interferometry Summer School that was held at the University of California, Berkeley. The one week event was sponsored by the Michelson Fellowship Program which is founded through NASA's Origins program and the Space Interferometry Mission (SIM). The main purpose of the summer school, which is in fact part of an ongoing series of such meetings that started in 1999, is to support the scientific community in building expertise in optical and infrared interferometry by bringing together students and researchers in all stages of their careers with interests that are applicable to infrared/optical interferometry. Although I have only attended the second summer school in the series, the main theme of this particular meeting in Berkeley was the scientific applications of infrared/optical interferometry. This theme was quite different from the one of the summer school hosted the year before which almost solely concentrated on the technical aspects and principles behind the stellar interferometry. Only after talking to Prof. Peter Lawson, the person responsible for organizing the event, who in fact graduated from UofT (not from the department of Astronomy, although he did know some people from our department) did I realize that the main plan of the series of summer schools is to concentrate on the technical aspects, then on the scientific applications, and finally on the practical use of stellar interferometers. After 3 years the cycle is supposed to be repeated. This also implies that next year (2001) the school will primarily concentrate on the practical and direct use of the infrared/optical interferometers. In all of the above cases, an expert in the field introduced the subject, gave a short review on what scientific progress has been made in the past, what are some of the unresolved issues, and finally how optical/infrared interferometers can play an important role in shaping our understanding of these physical phenomena. Although the technological development is still at the initial stages and most of the scientific applications, especially the ones involving faint sources such as galaxies cannot be yet applied, there is already much progress done on bright stars. For example, parameters such as stellar diameters, limb darkening and binary orbits are measured with unprecendent accuracy. Other areas of research with documented success include imaging star surfaces (star spots), measurement of pulsations (MIRA variables), and imaging dust distributions around stars. I have been exposed to countless number of new ideas throughout the duration of the summer school, but this could have been anticipated based on the fact that everyone presenting was indeed an expert in the field! What I have not expected is how beneficial and exciting it will be to actually meet in person these great minds. It included both these more formal meetings during coffee breaks and lunch, but it also involved talking to some experts in a more relaxed setting, during a banquet that took place one evening, informal evening meetings at a local pub, and a trip to Muir Woods - National Monument. Having a chance to interact and get to know graduate students and post-doctoral fellows from the United States and around the world was also a great experience. To conclude, I would like to recommend this type of summer school, or something in a similar summer school series, to anyone with even slight interest in infrared/optical interferometers and/or their current and future applications. I'm also more than sure that the summer school I have attended will influence me in a positive way for years to come. Even if it is only an increased awareness and appreciation for the incredible work scientists working on optical interferometers manage to do. The summer school concluded with the statement that in order to push the limits of the scientific knowledge and technology, both necessary in interferometry, one needs to be UNREASONABLE. Since many think the future belongs to those who are unreasonable, we will have to wait and see what that future will bring. The attached picture shows the Sather Tower which is the major landmark located in the center of the campus. The building seen to the left of the tower connects with the LeConte Hall where the summer school took place. You could also try searching LANL astro-ph: the e-preprints archive (the astrophysics bit).